Croyland, Or Crowland, a town of Lincolnshire, England, at the confluence of the Welland with two smaller streams, 8 m. N. of Peterborough; pop. in 1871, 2,413. It is a place of much interest to antiquaries, partly for its curious triangular foot bridge, dating from the reign of Edward II., but chiefly on account of the ruins of a famous and magnificent abbey, a portion of which is still used as a« church. 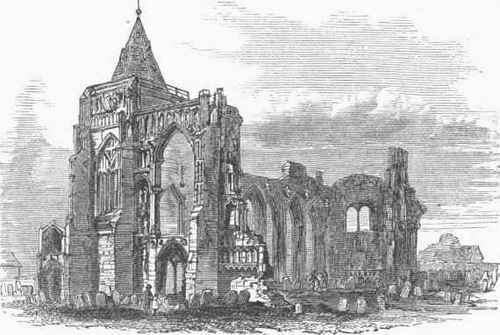 This abbey, founded by Ethelbald in 716, was several times destroyed, and rebuilt each time with greater splendor. Crucifix (low Lat. crucifigo, to fix to a cross), a sculptured or carved representation of the Saviour attached to the cross. The simple cross was the earliest symbol of Christianity. The sixth oecumenical council (680) ordered that Christ should be represented according to his human features, rather than in the symbolical figure of the paschal lamb, and in the succeeding century the crucifix became common throughout the church. Crucifixes are still preserved in a museum in Rome which date from the 8th century. This image is used by few Protestants, but is placed by Roman Catholics in churches and oratories, especially on altars, and is sometimes worn on the person. Cruciger, Or Creuziger, Kaspar, a German Protestant theologian, born at Leipsic in 1504, died at Wittenberg in 1548. He studied at Wittenberg, where he became connected with Luther, by whose favor he was appointed rector of Magdeburg in 1524. In 1528 he became professor of theology and court preacher at Wittenberg, in which offices he remained till his death. His services to the reformation consisted chiefly in aiding Luther to translate the Bible, and in taking part in the most important religious conferences of the time. - His grandson, Georg (1575-1637), was the instructor of Maurice of Hesse, and persuaded that prince to embrace the reformed doctrines. He was afterward professor of philosophy at Marburg, and attended the council of Dort. Crusade (Port Cruzado), a Portuguese coin, either of gold or silver, named from the cross, and palm leaves arranged in the form of a cross, which figure upon it. The first crusades were struck off in 1457, on the publication of a bull by Pope Calixtus III. for a crusade against the Turks. The silver crusades are called old or new, according as they were struck before or since 1722. The old are worth 400 reis (about 60 cents), and the new 480 reis. Csanad. I. A County Of Hungary, in the circle beyond the Theiss, bounded S. by the Maros; area, 638 sq. m.; pop. in 1872, 95,847, the majority of whom are Magyars, and the remainder chiefly Slavs and Roumans. The soil is fertile excepting in the swampy regions. Maize, wheat, tobacco, wine, fruit, honey, and wax are produced. Pasturage is extensive; cattle, swine, and horses are raised in great numbers, and there are also fisheries. The principal places are the county town, Mako, and the market town Nagy-Lak, both on the Maros river. II. The former chief town of the county, on the Maros, 7 m. S. E. of Mako; pop. in 1870, 4,013 (formerly much larger). King Stephen made it the seat of a bishop, who now resides at Temesvar, but the diocese retains its former name. There are remains of an ancient castle. In 1785 the emperor Joseph II. established in the vicinity a stud in which 3,000 of the finest breeds of Hungarian and foreign horses are kept.